John Simpson, former Director of Planning, Information and Performance Management has retired from the South Eastern Health and Social Care Trust following 34 years’ service in Health and Social Care. John was a social worker by profession and held senior posts in Child Care and Elderly services before moving into general Health and Social Care management. He was a member of Down Lisburn Trust’s Senior Management Team from 1994, firstly as Director of Mental Health, then Director of Acute Services and from 2002 as Director of Planning and Performance Management. From its establishment in April 2007, John was Director of Planning, Information and Performance Management with the South Eastern Health & Social Care Trust. 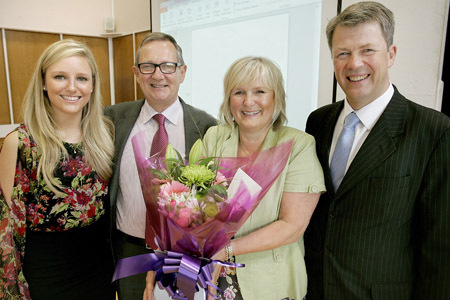 John Simpson pictured (second left) with his daughter, Katie and wife Judith and South Eastern HSC Trust Chief Executive, Hugh McCaughey.